Sadly, in every walk of life there are an unscrupulous few who spoil the party for everyone else. Football is by far the most popular team sport in the UK for boys and girls. But the huge number of children who play every week in football leagues all over the country make it a relatively easy target for those who want to push FA player eligibility regulations ot the limit. Traditional paper card and team/squad-based sheets systems are extremely vulnerable. Here’s a little tale of what could happen. The examples are not specific to any league or club and the graphics used are of our Managing Director’s own son. In a place far, far away, a Football League Player Registrations Secretary was dealing with a familiar issue. A mischievous manager had played an under-age player in a couple of matches. Against some stiff opposition, but with his superior aerial power, the early developer was able to cope in the air and to score a hatful at the other end. Things looked a little odd to some of the parents and other managers so they raised it with the league. An investigation showed that the player’s registration card photo did not match the photo on the FA’s Whole Game System. A clear case that someone, somewhere had tampered with the player’s paper registration card. But, lo and behold the same thing happened. A player who was not registered with them before their close date appeared on the squad listing. A simple bit of cutting and pasting …..Voila! The player’s photo was overlaid on the PDF file. This was then printed out. Quick and easy to do. Save time for membership secretaries – no more endless requests for their passport photos and then cutting and pasting them! Many security features to hinder card tamperers! ClubCards121 produce plastic player registration cards for three football leagues. These three football leagues have freed up their volunteers so that they can spend their time managing their leagues rather than doing the donkey work of producing registration cards! The quality of the cards is as you would expect – very similar to a credit card or driving licence, but without the holograms and special laminating. We have just printed another 8000 cards for the 2018 / 19 season! And distributed them to the local leagues. That’s 8000 players looking forward to their Saturday or Sunday game of footy. With many parents on the touchline watching their offspring chase the ball and try their hardest. Those parents are secure in the knowledge that all players on the pitch meet Football Association regulations. Over the season, we will cater for new players joining and players transferring or registering with other teams. Every week we have agreed with each league when to print these cards. 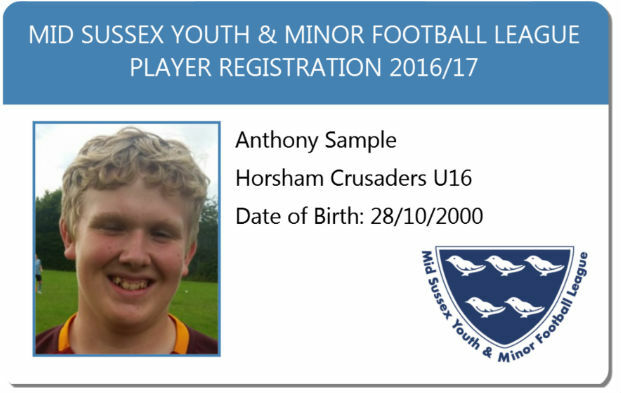 We then post each player registration card to the representative of the club in time for the weekend’s games. Keeping our kids active. And our doting parents and dedicated and hardworking managers happy. For more information on ClubCards121 bespoke football player registration cards service give us a call on 01403 230096. Or email us at cards@clubcards121.co.uk. We look forward to helping you save time and improve security managing your football league!